Look through our loss of a pet poems, quotes and sayings to assist you in your search for the best way to share your condolences or to help console your own loss. Dealing with a pet loss is something not everyone understands. Unless you have a pet who you are attached too, understanding a bond between a pet and its owner is hard to see. But let me tell you, the bond we share is like no other. It cannot be held up to any other in comparison. And every bond is different. One could be like best friends share, another could be similar to a mother and her child. The distinction between this bond is truly up to the owner. How far they allow this love to fall into their hearts will determine this bond. But the good thing is, if someone you know has lost their pet, you do not need to know the extent of their bond. The fact is, if their bond is quite close, you will most likely know just by their reaction to their loss or by the way they talked about their beloved friend before the passing. In any case, how you react to them should be the same as if they had lost a family member or a very close friend. Because in most cases, that is exactly what they have lost. Send them a sympathy card or a condolence letter. Find bereavement phrases that would best describe your grief for them if you are not able to write one yourself. Send them flowers or a gift basket. But at the very least, acknowledge their loss. This is very real to them, and if you are a close family member or friend, you should be aware of this and treat it as such. but now you are no more. It's where your paws would joyously abound. All it took was you looking up at me. That’s when I knew it was meant to be. I found you the perfect name. I made you happy and you did the same. We were together as much as could be. But I always knew you’d be waiting for me. We’ll meet again when its my time to pass on. I will miss you now that you’re gone. And hold him on my knee. How happy would I be. If having a soul means being able to feel love and loyalty and gratitude, then animals are better off than a lot of humans. No one loves you unconditionally as your beloved pet. Grief is so painfully real, regardless of its origin. The love of, and attachment to, an animal friend can equal that of human relationships. Likewise, the loss of an animal can be just as devastating. is in the heart of its master. Wishing you many moments filled with happy memories of your departed friend. May your memories give you wings to lift your spirits. 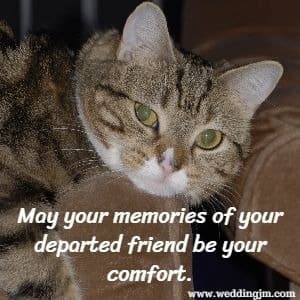 May your memories of your departed friend be your comfort. Sending you heartfelt sympathy in your loss. Wishing things were different, but knowing your departed pet will always be in your heart I know you will never forget! I'm sorry to hear your friend is no longer with you. May he have everything he loves wherever he is now. I completely understand what you are going through. I'm sorry you are having to say goodbye. My sympathies on the loss of your pet. May you find comfort in knowing they are happy, healthy and no longer in pain. I pray that you find the comfort and keep your memories close to your heart. So it is important not to brush off a pet loss in a friend or family members home and to make sure we send our condolences in some way or another. Sending a letter of sympathy may be the perfect fit. If you haven’t written a letter of condolence before, especially one for someone who has lost their pet, you may not know where to start. Below we have written a sample letter of condolence for the loss of a pet. You can take this exact message word for word and just fill in the spaces and make the changes necessary to make it more personalized or you can use it as a guide to writing your own condolence letter. Either way, we hope you will find it useful. I am so sorry to hear of the loss of your pet _______________. He/she was a wonderful dog/cat/________. I know how hard it was to see him/her suffering. At least now you can breathe a sense of relief that he/she is not suffering anymore and is in a better place. I know you would much rather have him/her with you, but at least he/she is happy and not suffering. Even though you are not with ______________ does not mean he/she is not with you. “Pets leave footprints in our hearts and memories in our thoughts that last forever." (Julie Hebert) There will always be a spot in your heart for those precious memories. If there is anything that I can do to help make this difficult time a little easier for you, please don’t hesitate to ask. Maybe we could just grab a coffee somewhere and talk or go for a walk around the block. Whatever it is that I can help with, know that I am here for you. My phone numbers are _____________.